EMpower works closely with grantee partners to provide support beyond financial assistance. Our partnerships can last up to 10 years. EMpower works alongside its partners, providing technical assistance to build organizational capacity. This support is typically in areas such as program monitoring and evaluation, fundraising and communications. EMpower connects partners across the globe. Bringing organizations together around youth issues formally and informally is an exciting way to share learnings and facilitate growth. EMpower-organized events bring together representatives from grantee partners and other experts including from EMpower’s Program Team, to share knowledge and tools on critical topics to improve effectiveness and further partnerships. By connecting grantee partners with each other, as well as with other experts and influentials, a web of learning and shared solutions is created. This approach helps strengthen grantee partners’ capabilities and accelerates progress towards goals such as keeping girls in school or preventing violence. Some areas of focus have and will continue to include: female entrepreneurship, monitoring and evaluation, gender-sensitive programming, sports and youth development, effective communications, diversifying funding and job paths for young women. ​EMpower held a Learning Journey on Adolescent Girls Programming in India from January 31 - February 2, 2017, bringing together nearly all EMpower partners in India for the first time! The 3-day workshop was a rich, exciting exchange of ideas and expertise on how to design and improve programming for adolescent girls. Staff members from 21 grantee partner organizations attended, as well as adolescent girl participants from the Adolescent Girls Learning Community in Mumbai and Delhi-based programs. Each grantee partner representative presented an innovation that they have developed or implemented in their programming for adolescent girls. These ranged from methods to increase girls’ agency through starting a community newsletter, to techniques for improved monitoring and evaluation, to including youth in decision making. The EMpower-created tool, The Girl Path, offered a structure to the workshop as participants brainstormed the challenges that adolescent girls face as well as potential solutions. Participants walked away with skills, strategies and activities to directly implement, improving their programming, monitoring and evaluation in engaging adolescent girls. Check out tools for designing programs for adolescent girls, including “The Girl Path,” here. An EMpower Learning Exchange on Adolescent Sexual and Reproductive Health and Rights (ASRHR) was held in Jakarta, Indonesia, bringing together participants from 10 grantee partners from India, Indonesia, the Philippines and Vietnam to share program ideas and strategies on SRHR. Read more here! 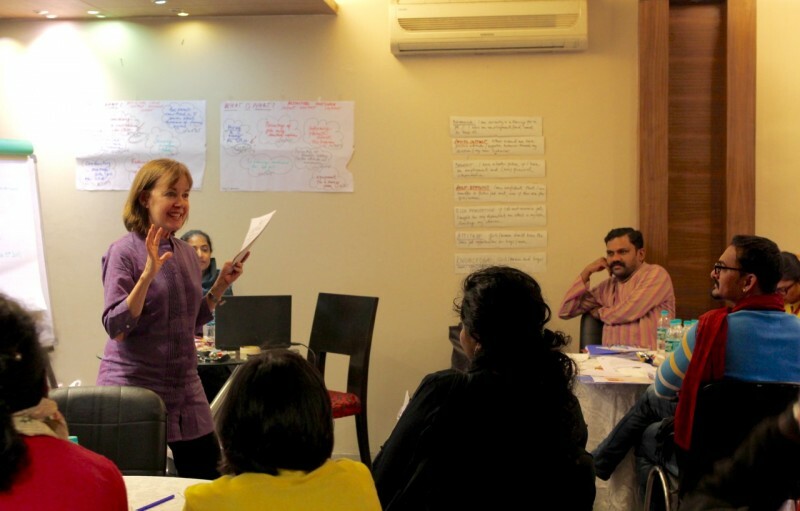 This three-day workshop on strategic fundraising was conducted by EMpower for 12 of our India grantee partners, to better understand the landscape for fundraising and prioritize strategies that work for each organization. Read more here! EMpower’s grantee partner Azad Foundation in Delhi hosted a workshop for another EMpower grantee partner, Network of Women in Growth (NEWIG) from Ghana, to share best practices to structure a driving training program for women in Ghana. Read more here! A Learning Exchange in Guangzhou, China brought together EMpower’s China-based grantee partners for a workshop on story-telling, and gender-sensitivity and awareness, providing effective communication strategies to amplify girls’ voices. Read more here! This 4-day, EMpower-organized Learning Exchange in New York brought together experts from 9 community-based organizations from 6 countries that are working to open new opportunities for women and girls to have more secure futures through nontraditional jobs. Read more here!